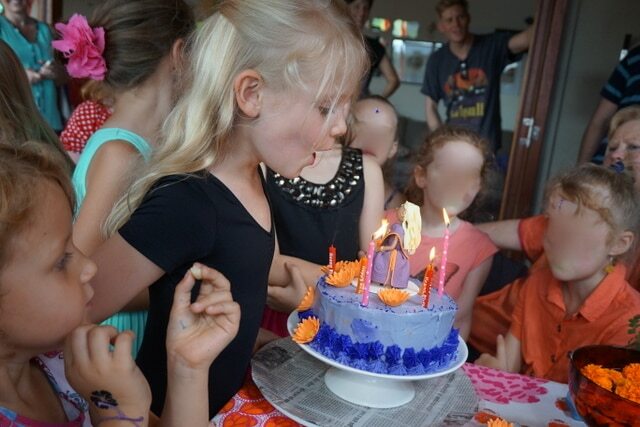 PudStar’s 7th birthday party theme came about over a family dinner discussion…oh…about a year ago. 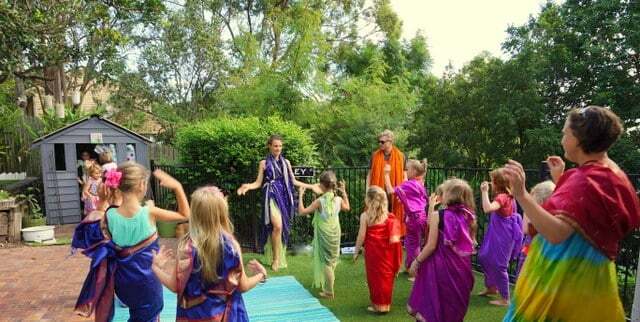 Disco parties for young children were mentioned and discussed and dissected and debated and theorized before my mum piped up with ‘I reckon a Bollywood party is a better idea!’. Sold! To Pud. PudStar had recently taken part in a ‘Dance Masala’ workshop on a school excursion to ‘Out of the Box’ and we’d hiked back in on the weekend with cousins in tow to participate again as she had enjoyed it so much. .
All of our book parties to date have book themed (see here) – this one was the opposite way around! Theme decided, then books sought on India so that Pud understood where Bollywood originated from – sheesh I am a such teacher librarian. 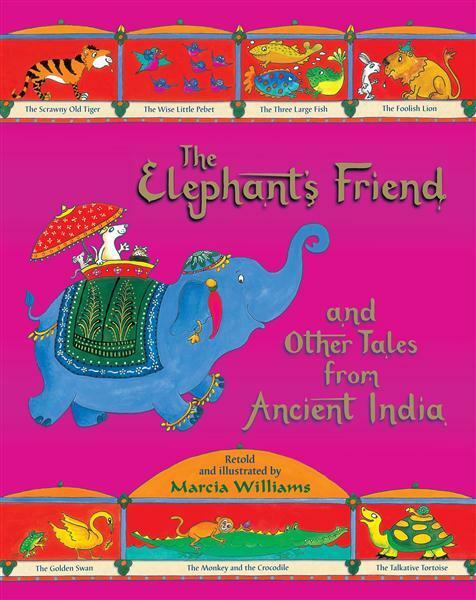 Her favourite Indian themed books are at the end of this post, along with my favourite Indian cookboks. We have quite a few Indian family friends – the most ‘famous’ of whom, Peter Lane, married Dan and I in conjunction with Dan’s local priest who must have wondered what he had agreed to – Peter was fabulous! I’ve known the Lane family since I was born and his gorgeous daughter Jo is not only a very good friend of mine but is also a talented photojournalist and has a charity called ‘Camera’s for Asia’ which does some wonderful work conducting photographic workshops in places like Burma and India and leaves cameras behind with the community. We we support ‘Cameras for Asia’ through buying excellent honey (so hard!) and donating no longer needed cameras. I digress – PudStar was sold on the Bollywood theme and as dad works in Singapore quite a lot and seems to spend an awful lot of his time there eating in Little India, he was in charge of purchasing saris and bracelets – the bracelets became the ‘party bag’ gifts. PudStar is actually embarrassing in her enthusiasm for party bags – often wanting to leave a party just to get the party bag. Sigh. Poor anxious Tyson has no idea what is about to hit the deck. Despite extra Valium he was a nervous wreck! My brothers girlfriend, Sam, who we are all in serious awe of for her ability to run, jump, hop, skip, kick, cycle, bend her body and cook amazing food, was enlisted as the Bollywood dance teacher and of course did an amazing job organising posters which showed all the basic moves, working out a number of routines to teach and then organising pretty much a Bollywood interpretive dance session with enthusiastic 7 year olds. This is my form of outsourcing – enlist family members to do the work. 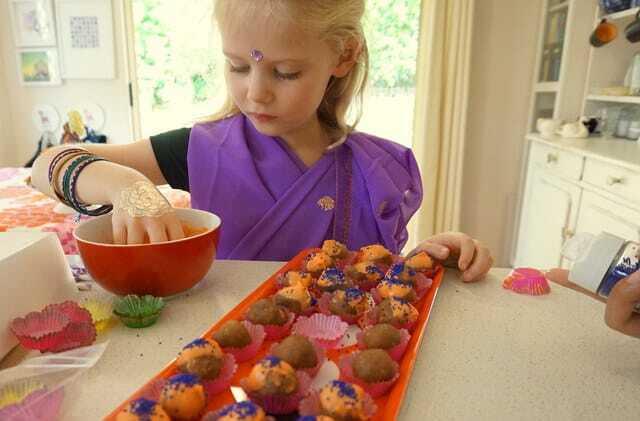 Purple and orange were the colours of Pud’s favourite saris and a visit to a $2 shop and Indian grocer sorted decorations. 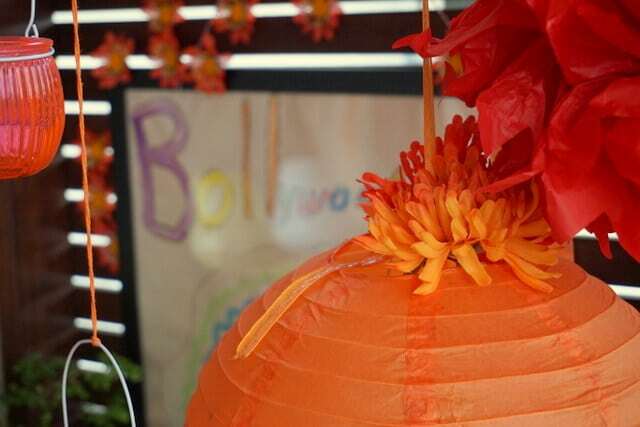 Pud made several signs and glued marigold type flowers onto lanterns and tissue paper balls. Candles in orange jars and bowls filled with marigolds from the garden sorted the food, drinks and activity tables easily. Even the cubbyhouse shelves, and the fairy garden ‘fairy pool’ (I thought it was a stone water bowl, apparently it is a fairy pool) at the front steps got a sprinkling of marigolds. If nothing else, Pud is thorough in her styling. 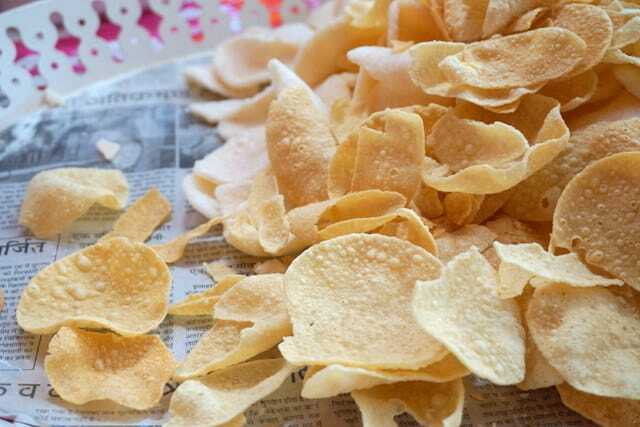 The sari’s from dad came wrapped in Indian newspaper so all platters were lined with this and then covered in plastic – cause no one wants to eat newsprint. Fair few marigold went in Pud’s hair also. Stealing decorations. We had gold and silver henna style temporary tattoos (I wasn’t confident with real henna!) and ‘bindis’ to apply to the guests when they arrived. Not being Indian (you’d never have guess with all that blonde hair would you? 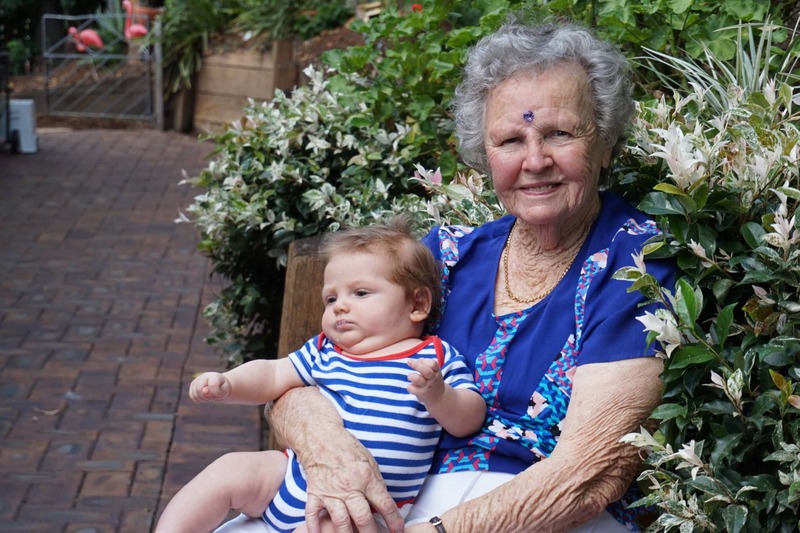 ), it didn’t seem right to use real bindis, but purple glitter dots were a hit – even on nan – who was in charge of baby holding. The girls were then helped into their choice of sari – from the floor – folding is not my thing – and bracelets were added. After dots, bracelets, tattoos and saris were organised the girls all made beaded anklets and bracelets with lots of bells to tinkle when dancing. ChickPea upended many containers of beads and generally got in the way – she also refused to remove her dinosaur t-shirt, so she was a sari wearing dinosaur. 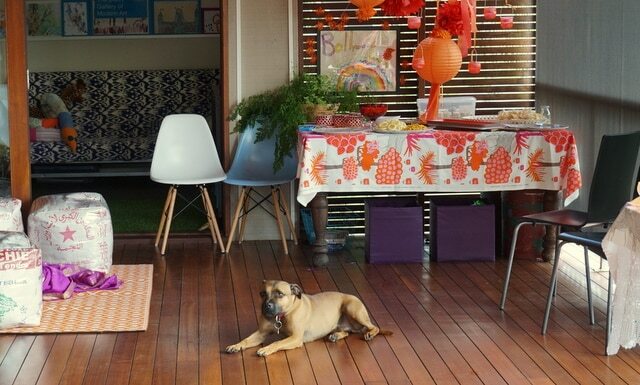 Neighbours make the best party guests. Nonna having her tattoo applied. 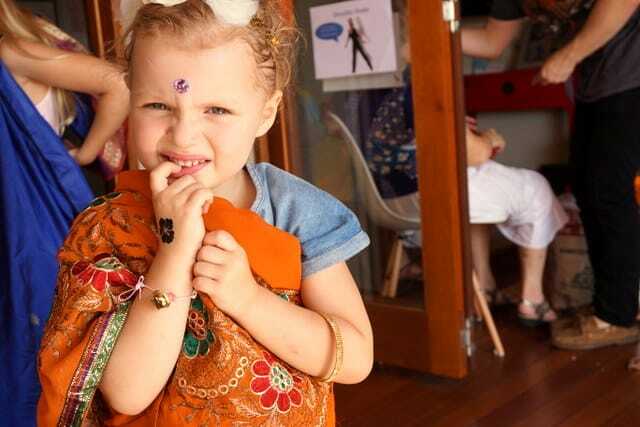 Love this photo of the girls in their sari’s! 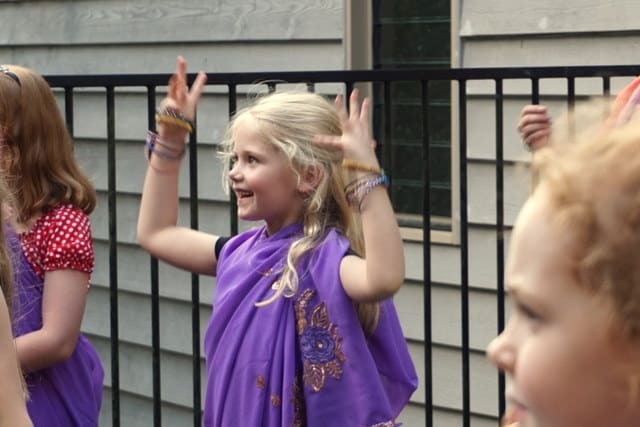 After food, there was the Bollywood dance class – Sam totally missed her calling in life as a teacher. 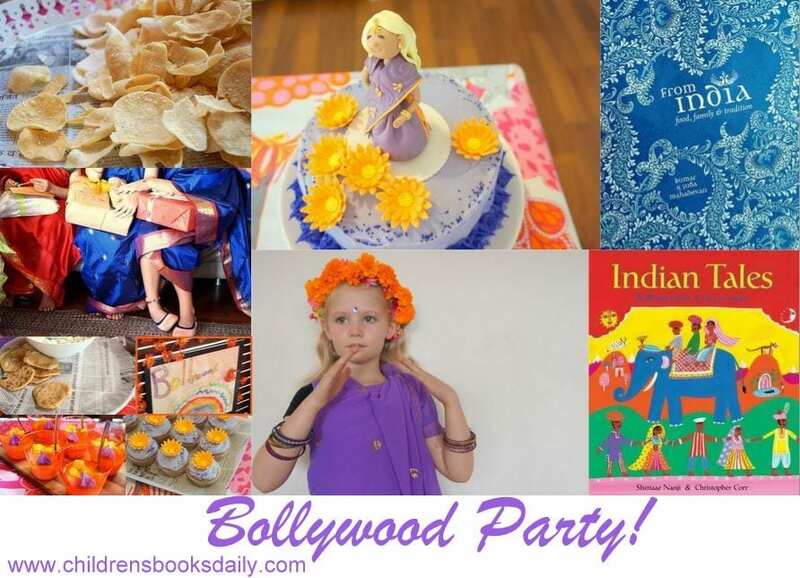 If you don’t have a Sam in your family, ‘Dance Masala’ run children’s party events – see here. 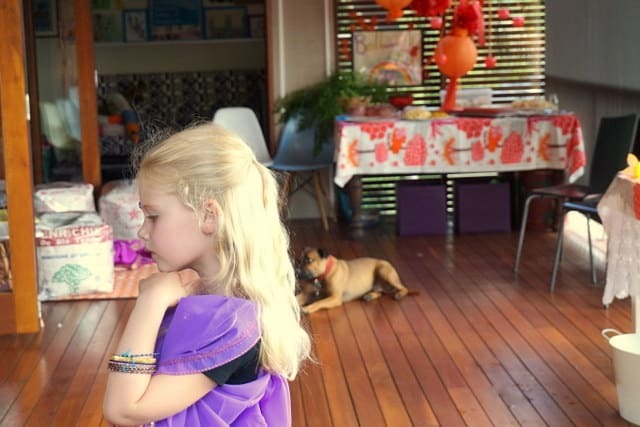 The 7 years old absolutely loved the dance class, while ChickPea and her band of smaller siblings ruled the cubbyhouse and shouted at anyone who came near them. Entirely appropriate. The food is always the best part of a party to my way of thinking! I couldn’t really give a hoot about the decorations and the ‘flow’ (sorry mum)…I just want to sit down and plan food, cook food, then eat food. PudStar’s first birthday was a Middle Eastern feast (here) – with a side serve of Miffy theme (so it looked like a kids birthday!). 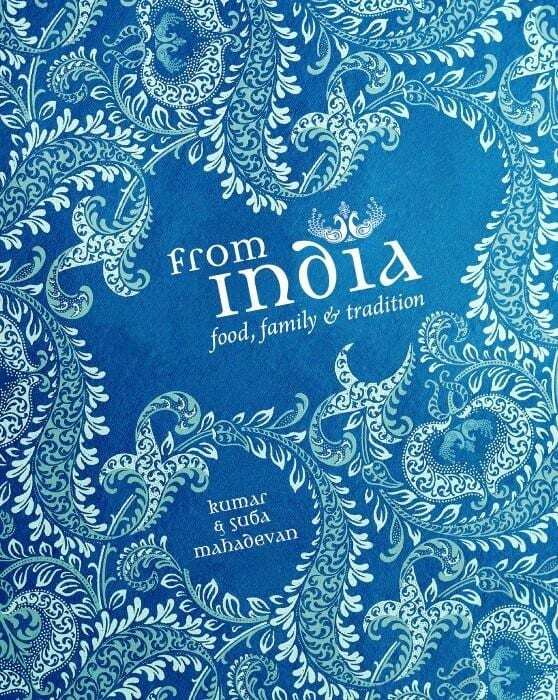 I have many Indian cookbooks, and many recipess from family friend Mrs Nair. 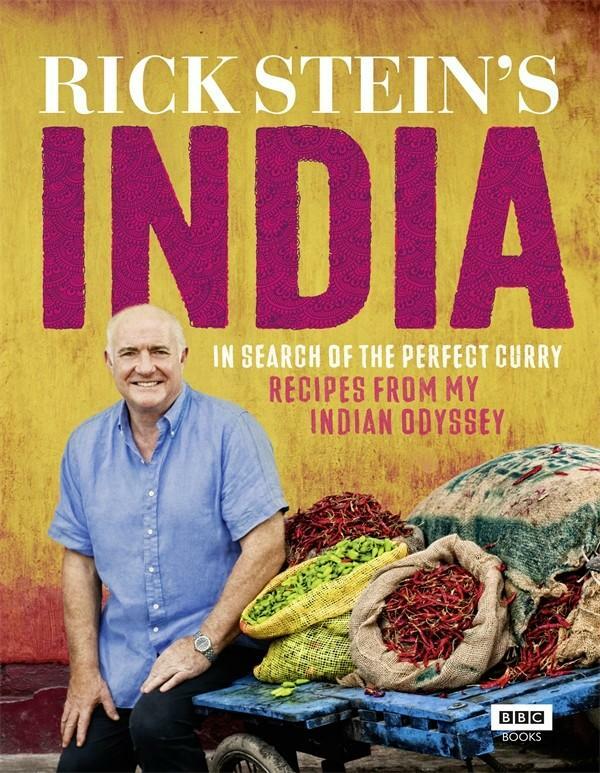 My fav Indian cookbooks – and the most authentic I’ve found are ‘From India’ (gorgeous hardcover, cloth bound book) and Rick Stein’s ‘India’. Both require multiple trips to the Asian store for ingredients – and we have multiple Asian shops just around the corner which I visit sometimes weekly. 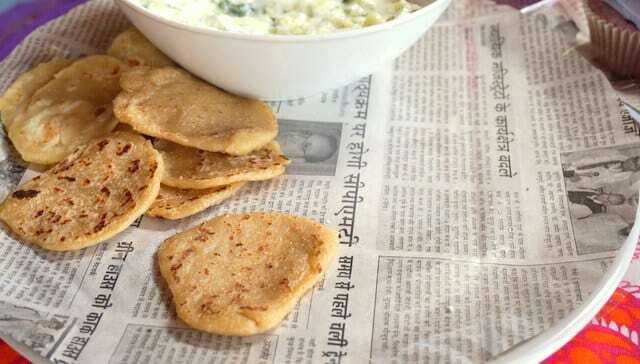 Given this was for 7 year olds who probably weren’t into chilli and spiced laced curries, we just had mild curry puffs with chutney, teeny tiny naan breads with cucumber and yoghurt raita, pappadums, onion rings and that Indian cracker mix thing I can never remember the name of. 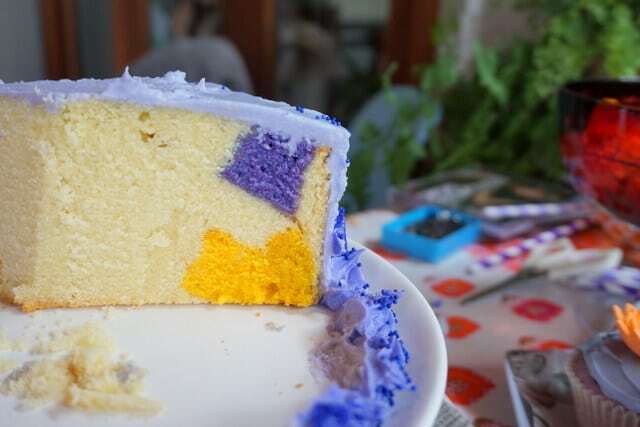 Followed by orange jelly with mango, mango lassi drinks, cupcakes (bubblegum flavoured – don’t ask) with marigolds, cake ball things made by Pud, melting moment biscuits with purple icing made by Nan and birthday cake. For the first time ever I ordered the fondant flowers and fondant cake topper. I was going to make them myself but I am ridiculously busy at work and I know this gorgeous girl, Sammy from ‘The Cupcake Taste’, so it was a no-brainer – and clearly she did a MUCH BETTER JOB than I would ever do! Her figurines are cute but not kitsch and I do so love to support a local business. 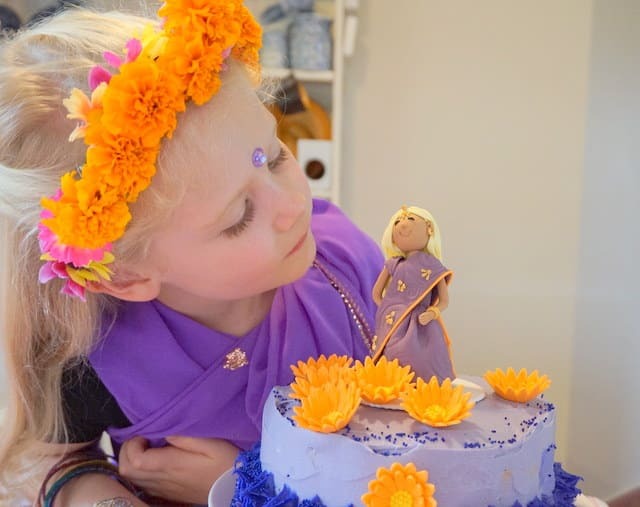 She nailed it with the blonde haired Bollywood dancer – PudStar was stoked, as I was…cause all I had to do was make a round cake and ice it. This was all a lot less food than what I normally make….cause I have discovered that other people (especially excitable children) do not necessarily share my belief that parties are about food. So to the books! 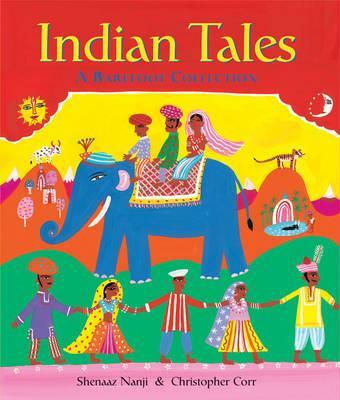 Borrowed a stack of nonfiction books on India for Pud but most of all she loved these two books of Indian folktales. Below those is my favourite Indian cookbooks as mentioned above and one of my favourite Bollywood movies – which Pud also loves, ‘Bride and Prejudice’, a Bollywood style ‘Pride and Prejudice’ – brilliant! ‘Monsoon Wedding’ is one of my other favourites and we used this soundtrack for the part (thanks Baker family!). The other movie we watched was ‘Bend it Like Beckham’, which is by the same director as ‘Bride and Prejudice’ and I think it was one of Keira Knightley’s early films – I’ve always loved this movie! Click on titles or front cover images to add these books/DVDs to your home, school or library collection. Do you love Bollywood? Hit me with your fav Bollywood film, I need some more! Just getting in some practice before the guests arrive! Happy, happy birthday precious Pud you are so beautiful inside out and upside down. There WILL be a present from the Rileys yes there will. Megan there is even a pic of Dan with a bindi – not one pic of you? Were you too busy near the cake? I would have been. I would’ve unravelled that fondant sheet quicker than a brides nightie. Your best post yet … so wish we lived closer to each other!! What a great idea! 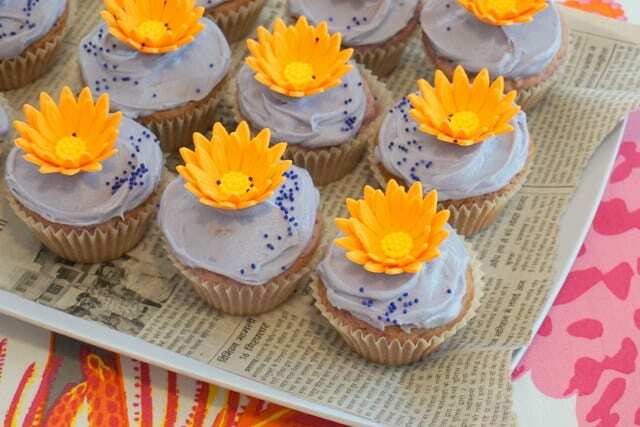 I love those funky little cupcakes! Oh my goodness, this is just the best idea for a party! 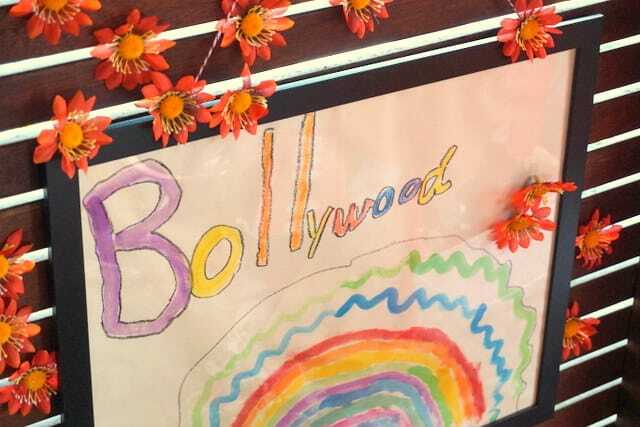 I am going to have to show my sister-in-law because she is a massive Bollywood fan and would love to do something like this for her own birthday! Thank you for sharing, it looks like you all had a fabulous day! Oh! I just saw your comments! I am the MASTER of convincing my children what sort of party they (me) want! THE MASTER. It’s all about me isn’t it? !